Here’s our 15 best free & paid deck design software programs to help you create your ultimate outdoor living space. Looking to do a DIY Deck and don’t know where to start? Check out these programs to create a unique design for your dream deck! Many of these programs will help with permitting, materials & brand selection, pricing and even quantities of material needed. Not to mention the amazing visualization tools that are included to help you see your design layout and how it will look in your backyard. Here our the best deck design software programs we could find in 2018 listed in no particular order. If you’re looking for interior design software click here. Through TimberTech, by AZEK Building Products you can find inspiration and create a 3D layout. This program has 140+ products that can be chosen from using AZEK and TimberTech’s lighting, railings, decking, accessories and anything else needed when creating an outdoor deck! They allow users to test out the software and it is available in the app store for IPads. This program has features such as the snapshot feature, which allows you to attach your own photo. There are plenty of options from previously designed templates to showing the design in an augmented reality state. The only real downside to this program is that is only allows the products that are part of the brand and is only available for IPads. To properly use this software is it recommended to use chrome, firefox, safari or Microsoft edge. This program is free after creating an account. 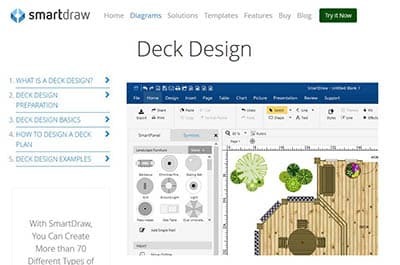 SmartDraw’s Deck designer gets a 5 star rating from CNET Editors. This program allows quick dragging and dropping of elements such as boards, railings, planters and you can even add furniture. 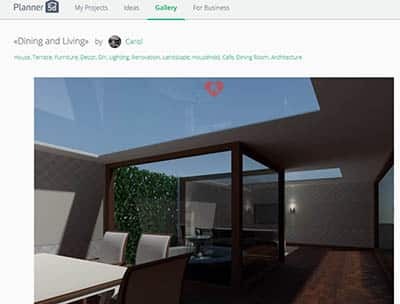 They include graphics for elevation posts, support and surface boards, planters and flowers, hot tubs and Jacuzzis, umbrellas, patio furniture, and benches. They also have a complete landscape package that can turn a deck project into an entire backyard design. 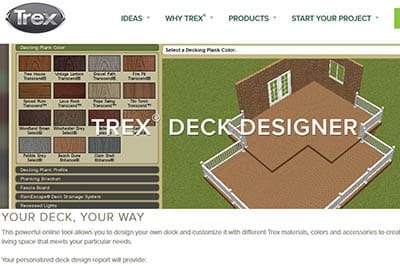 This Deck Designer software is also sponsored by TREX, therefore will use many similar features and materials. Deck Designer will allow you to drop in shapes for the deck, add multiple level and add stairs where needed. To use the Lowes designer and planner you must have Java 1.4 and Adobe Acrobat 3.0+, no worries if you do not, it will allow them to download. Once downloaded you will be prompted to either start from scratch or to start with one of the pre-designed decks that are previously loaded. From there you can design your dream deck with planks, railings, stairs etc. This is a free program. The home depot offers a wide variety of “Do-it-yourself” tools which means they have some experience in this department. This program starts you off with over 70 built in templates to help get started. The program will then print out a list of all the items you will need for the entire project including the price you will pay for supplies and materials. To run this program you will need Windows system with Intel 17 Quad Core CPU, 4GB of available Hard Drive Space, and internet connection. This is a free program powered by Edgenet outdoor projects. Sketchup is commonly used in educational and professional settings. Sketchup is available in a free version and a pro (paid) version. The free version is available in a web browser. This will allow the user to draw, push and pull extrusions, orbit the screen and add colors and objects. The free version is available at app.sketchup.com where you can immediately start sketching. It also has features that allow collaboration and sharing qualities. This can be used to leave replies and comments or assign tasks to others as well as seeing a history of changes made. Sketchup Pro has even more features and even a free trial version of that. Pro can be used on Windows or MAC operating systems. Pro requires 3D class video graphics by NVDIA or AMD, they do not recommend Intel based graphics just yet but are working to include that. 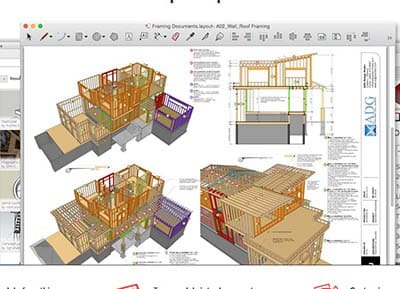 Sketchup Pro can create endless drawings, including scaled drawings, sealed drawings, presentation documents, walkthroughs, as well as having them be highly accurate and detailed. Sketchup Pro can be purchased for $695. There are also options for upgrades, renewals, and discounts for educational licenses. 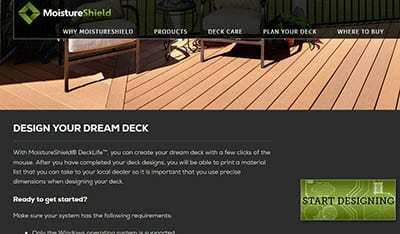 Moisture Shield Dream Deck Designer is another program that is quick and easy to use and will allow you to print a list of the materials needed for the designed project. The software will be a tool in creating and saving multiple designs if you are unsure the best choice, it also will let you choice the size, shape, and color of the deck. 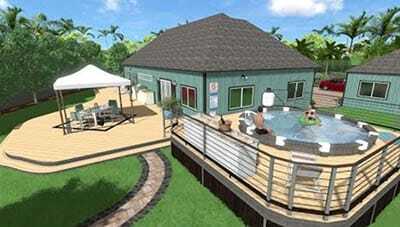 Menards Deck Estimater will allow you to create your dream backyard in 3D on any computer or in any Menards store. This program will create a list of materials needed for your backyard project. This is an online software and will require a Java application, which can be downloaded on the site listed later. 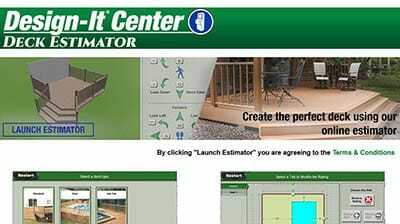 Menards Design it Center Deck Estimator is a free program. Punch! 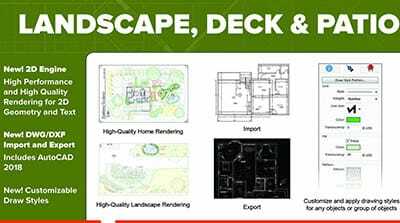 Landscape Deck and Patio version 20 can be used to create and design outdoor living spaces with a complete set of tools to plan, design, and visualize the desired space. This program has some new features including high quality rendering for 2D geometry and text, customizable drawing styles, the ability to import and export from AUTOCAD 2018, custom rich text options and a modify tool bar. This software requires 1GB of RAM and 3GB of haard disk space. Internet service is required to use the program. Punch! Landscaping software will run you about $39.99. Chief Architect is one of the leading developers and publishers of 3D Architectural home design, and have also developed a software for landscape design that is just as up to par. This is often used by architects, interior designers, landscape designer and home designers, even DIYers. As this is a large program it requires a PC or Mac with at least 4GB of memory and 5 GB of available hard disk space as well as internet access. 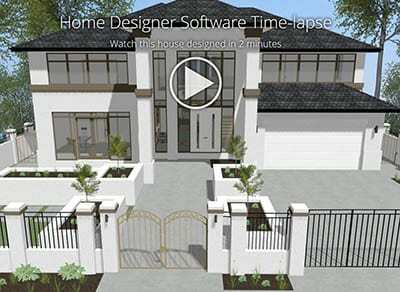 This program can be rented for $49/mo and can be found at https://www.homedesignersoftware.com. This program is also available as a trial version as well as for purchase. Prices range depending on which version you choose Pro being $495.00. Decks and Landscaping can be done in the versions Suite, Architectural and Professional, professional and architectural being rated better. https://www.homedesignersoftware.com/products/product-chooser.html is a good reference for deciding which program best works for you, detailing features that are available per each version of the program. Idea Spectrum is an easy to use program that the Architect version will create 3D landscape designs, design over a photo of your current landscape, add water features (pools ponds, waterfalls) and create landscape plans as well as CAD drawings and includes 17,000 design items. Other features (but are not limited too) that all versions have access to are: pre-built pools and spas, 15 national brands, ability to import sketchup models, designing single and multistory decks and adding patios, retaining walls and edging. By far one of the programs with the most opportunity. This is a free trial or paid version that can be found at https://www.ideaspectrum.com/. The Architect 2018 software will cost $399.95, Pro $99.95 and Plus $79.95. This will be a one time purchase, with future upgrades usually being available for a discount. Planner 5D is a versatile program that can be used to design backyard decks as well as patios, landscaping and other areas within the home. The program itself offers the ability to design in 2D and then see your work in full 3D for a complete picture of how the design will look. There is also a large database of user created designs for ideas and inspiration. The app can be downloaded to your device via Apple Store or Google Play. TREX is a designer tool that is available in both desktop version as well as a mobile app. This will create easier access and more options for users to use. To use either of these tools you will, choose deck dimensions and railings, then pick out TREX materials and finishes. The system then makes you a list of the items you will need. This program also has a section for ordering sample boards to help make sure you get exactly what you want! 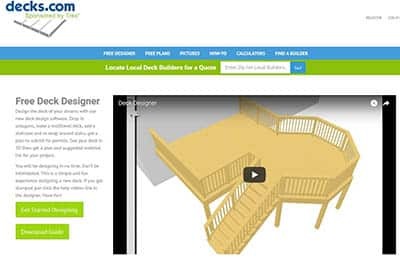 This program includes easy drag and clip options to create a quick and easy custom deck that will allow you to add color materials to the 3D drawing.They offer a gallery of deck plans, a contractor gallery and product gallery to help with your design ideas. 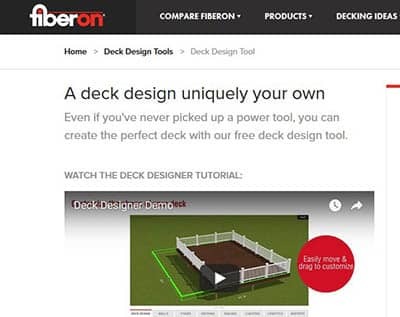 Fiberon tool will produce 3D deck design, installation checklist, and a list of local retailer and contractors near you. This is a free program. You can also download a free deck planning guide with information including deck design options, materials needed and budgeting. 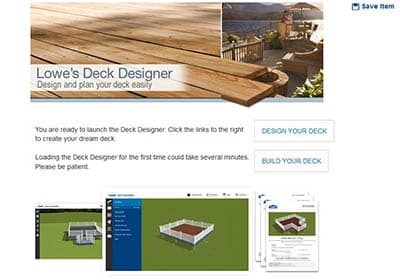 This deck design software program is easy and fully customizable. 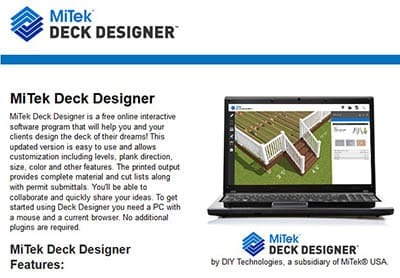 MiTek Deck Designer will allow you to add multiple levels, plank direction, size and color, plus many other options. At the end you will be provided with printouts of required materials, cut lists as well as permit submission. This simple program will allow you to complete deck designs quickly. It is an easy to use program as well as completely web based to avoid large downloads. The program allows you to design a deck, and then from there print the materials list and permits. Deck Planner will give recommendations and allows you to see the materials you wish to use for the deck. This program is available on Mac or windows operating systems, and must have a graphics card with at least 64 MB of memory. This is a free program. What is the Best Deck Design Software Program? After reviewing the attributes of each of these software programs one of the biggest factors of deciding which works for you is what you need it for. If you are just planning on completing one deck project for a residential, personal back yard, one of the free software programs offered by one of the big general home construction brands will probably work best for you. 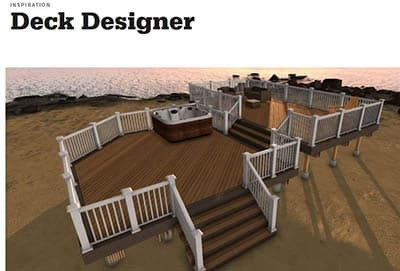 These deck design software programs tend to be more structured to individuals with a little less of a background on designing and building things. This will mean that the software will require less manual work and will be quicker and easier for users, but that takes away a little of the customization, and directions that you can go into. 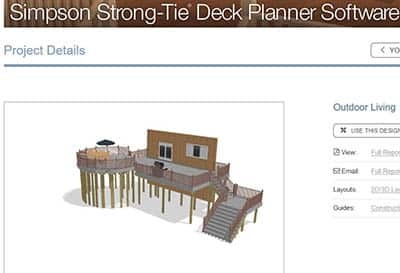 Two of the most popular standout programs are Smartdraw and Sketchup, while Planner5D is versatile for designing not only decks, but backyard landscaping and patios as well. For architects, or professional deck builders, the programs that are paid to use or paid by subscription will be better utilized. These will give experienced users access to more customization and options to complete many different projects including deck design. Often the paid versions are used by people who will be designing decks, patios and even landscapes in a professional capacity. As you notice in the descriptions get more advanced and have more loaded I features, the price goes up. Even some professionals will not need all the possible features, which is why some programs offer different levels at different pricing, to further cater to the individual and individual’s projects. Big or small, any project can be tackled quick and easy with the help of computer aided design and these ones in particular are the top of the market and worth checking out. 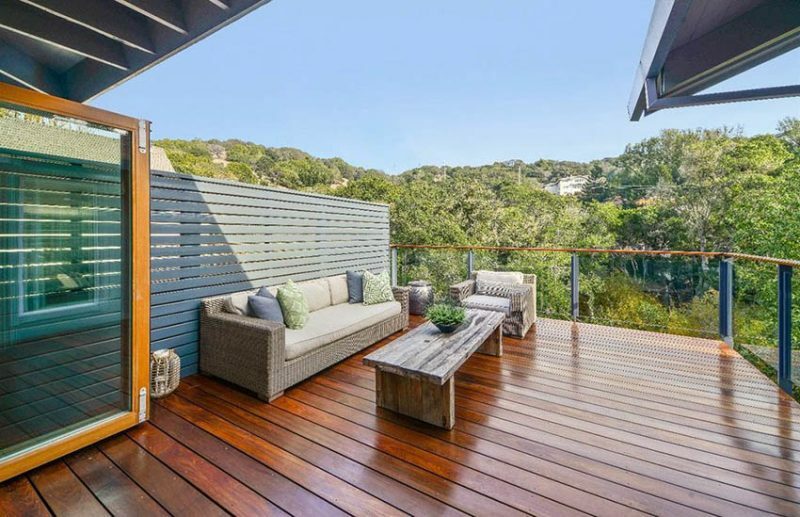 For even more design inspiration check out our gallery of backyard deck designs and ideas here.